Chia seeds are unprocessed whole grains derived from the desert plant known as Salvia hispanica. Grown in Mexico centuries ago, during the Aztec and Mayan civilization, chia seeds have been famous for their use in growing chia pets, and are now becoming popular as a healthy addition to one's diet. 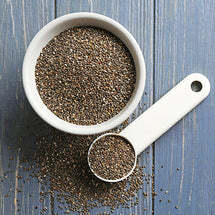 Chia Seeds are a whole, vegetarian super-food naturally rich in Omega-3 essential fatty acids, dietary fiber, antioxidants, protein and amino acids.